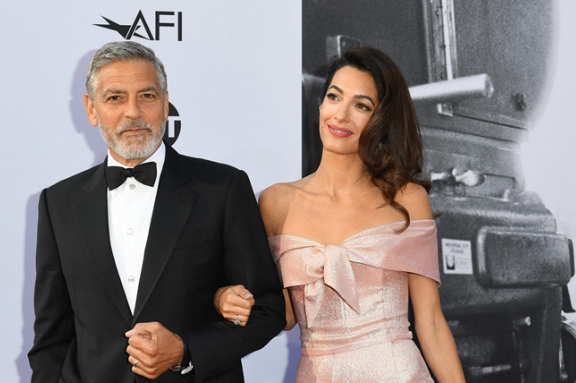 George Clooney introduced himself at Variety's Power of Women event as 'Amal's husband' on Friday before delivering an emotional speech ahead of presenting the award to Parkland shooting survivor Emma Gonzalez. He introduced himself in the most appropriate way, considering the crowd. 'Hi I'm George, I'm Amal Clooney's husband,' he quipped . Meanwhile, Amal, world renowned human rights lawyer, was in Philadephia to headline a women's conference. The couple tied the knot back in 2014 after decades of the A-lister being Hollywood's most eligible bachelor. At the event, George launched into a powerful speech about fear in America. 'It's an honor for me to be here today to give the award to the fearless Emma Gonzalez,' he said. Gonzalez, 18, became a fierce advocate for gun control in the wake of a mass shooting at her high school in February. 'We're living in a time where fear is our stock and trade,' the actor said. 'Fear of Muslims, fear of immigrants, fear of minorities, fear of strong women. After the shooting, George and Amal donated half a million dollars to the March for Our Lives movement, which was started by Gonzalez and her fellow survivors. Later Emma took the stage and gave her acceptance speech. 'Nothing made sense in those days, except for the fact that there was nothing to stop this from happening to anyone in a country with practically no gun safety laws,' she said.